It was on our second day in Hvar, that we went out on two speed boats. We spent pretty much the whole day on the boats. Music blaring, sun beating down on us and everyone in amazing moods and enjoying each others company. The sea was insanely clear and so blue which was gorgeous. It was nice and refreshing to jump into the sea after being in the sun for so long. Sam and Lydia took plenty of group photos of us jumping off the boats. And also the cliffs diving in the sea which our photographers got some amazing shots. We stopped in various different coves for people to snorkel and swim in the sea before stopping at a local restaurant for lunch. We stopped in Milna to a restaurant that our boat driver and Mollie had arranged on taking us to to cater for everyone’s dietary needs. The restaurant was called Kod Barba Bozjeg. It was right on the sea front with perfect views of the sea all around and they cooked up a mean mixed grill for those who love meat or fish. Me and a few others had vegetable pasta which was really yummy! Photography in this post by Lydia Collins. 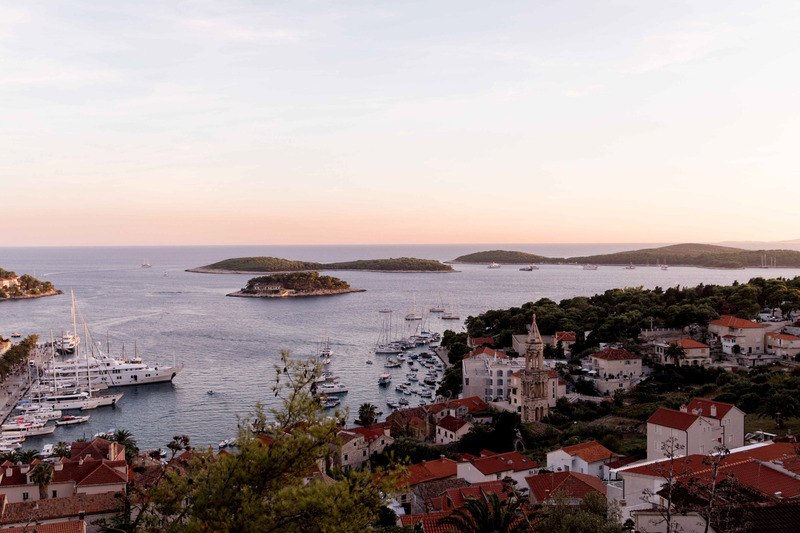 Have you been to Hvar before? Would you want to go there on your trip? My post going out today is my travel bucket list and Hvar is on it! I can’t get over the scenery, it’s so pretty! I hadn’t thought to do a boat trip – what was the company called?